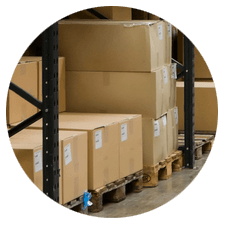 There are a variety of types of pallets to choose from when you’re looking at purchasing them for your business. In addition to considering wooden or plastic pallets, corrugated pallets have become a viable option for certain companies over the last twenty years. Corrugated pallets are essentially made out of paper, but don’t let that fool you. They’re stronger than they sound! They can be made of corrugated fiberboard, laminated paperboard or even partial wood decks. There are a variety of ways paper pallets can be put together that includes staples, glue and paper cores. Affordable to transport due to reduced shipping costs because they are lightweight and collapsible. Like wooden pallets, corrugated pallets are also customizable and can be designed to support your product’s size and weight. This could allow you to fit more products on one semi-truck load due to better use of space. If storing pallets indoors, warehouse space required to store corrugated cardboard pallets is reduced since they can come flattened or unfolded. This allows you to save the space until the moment that you need them. They can be recycled after use just like regular cardboard. With that said, it’s important to note that wood pallets can also be recycled either by reconditioning, reusing or recycling them into a usable material such as mulch. They are not as durable should they become moist. Think about the last time you had a package delivered and it sat in the rain – the box became a soggy mess! They don’t hold up well over time if they are outside due to the weather conditions. Not only moisture from rain and snow will degrade the corrugated material’s structural integrity, but also heat. Cardboard tends to become softer and less rigid when exposed to high temperatures. This means they must be stored indoors, taking up valuable warehouse space. Due to lack of durability, in most cases, they can only be used once. While the cost of one cardboard pallet may initially be cheaper than one wooden pallet, consider that cardboard pallets can usually only be used once. Over time, they may end up costing your company more than an initial investment in durable wood pallets. These types of pallets are impossible to be cleaned or sanitized. You would need to buy new ones should these become ruined. Direct Supply can provide custom corrugated pallets from any corrugated pallet manufacturer. Buy them in standard sizes or have them tailored to your specifications. Let Direct Supply, Inc. be your corrugated pallet supplier! Contact us today and we’ll help you make the best pallet choice for your business – whether that’s a corrugated solution or a traditional wooden pallet.